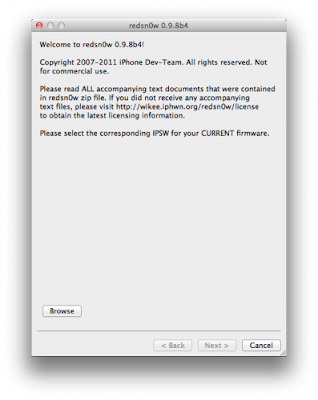 The iPhone Dev Team has released a new version of Redsn0w to perform a tethered Jailbreak on IOS 5 Beta 4. In conjunction with iOS5 beta4 being released to iOS developers, redsn0w 0.9.8b4 is now available for jailbreak app developers. Remember, it's a tethered jailbreak right now so you'll need to use redsn0w to boot into a jailbroken state at each power cycle. NOTE: It appears that by design, the OTA update that became available starting with iOS 5 beta4 will *not* be automatically applied to jailbroken devices. That's a relief to those who don't want to lose their jailbreak via OTA pushes. If you're jailbroken, you'll need to use the standard iTunes method to get to iOS 5 beta4.